I have a confession to make, I love Dreadnoughts! I have probably built and converted 20 or more Dreds over the last 10 years. It was only fitting that a Dreadnought formed the basis for my Nurgle 40K army. 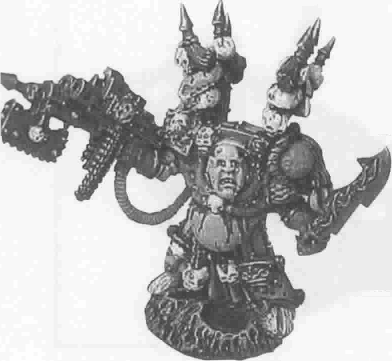 I had already made a Dred model called "Lothar Bubonicus" in 1998 as a 40K Demon prince. 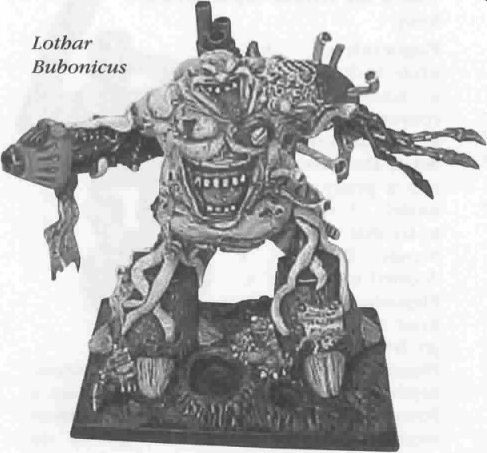 In a very old WD there is a story of the trials and tribulations of a Nurgle Champion called Lothar Bubonicus. 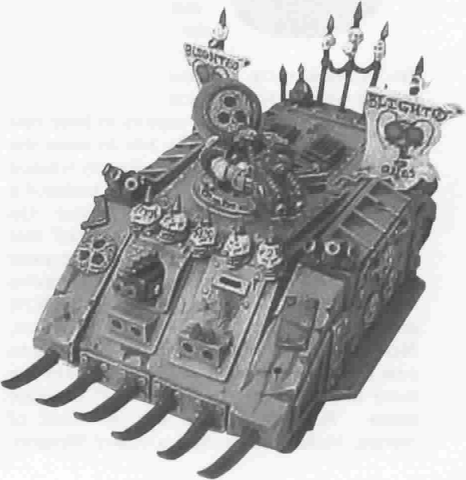 Since the Chaos timeline is flexible, why couldn't Lothar have fallen in battle, been entombed in a Dreadnought and kept fighting for Nurgle? I made Lothar and loved him! At the time it was my favourite conversion that I had done. But, to cut a long story short, in each game Lothar would stride onto the field of battle, scare the hell out of my opponent and get hit by every heavy weapon on the table, then collapse in a pile of pus! So, I had this beast of a Dred, but no real force to go with it. He needed an Army. 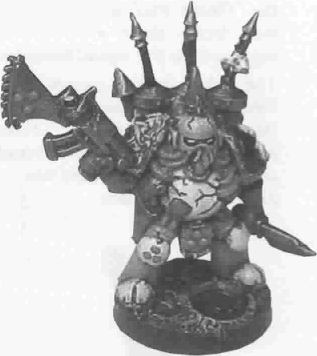 The Death Guard were one of the original chapters to convert to Chaos. To keep with this theme, I wanted to use "regular" Imperial Space Marines and equipment, converting and corrupting it to make it suitable for the Lord of Disease. I had to select a more corporal leader for my Army, as Lothar was trapped in the Dred. I really liked the newer WFB Chaos Sorcerers, especially the fat fellow. What would he look like in terminator armour? I used various bits and putty to come up with Bernard the Swollen, champion of Nurgle. Part of his history involves his time as a Raptor Champion, but he became too fat (blessed by Nurgle?) for the jump packs. This did a couple of things: first, giving me a reason to have Raptors and bikes for fast attack, secondly explaining why he was such a fat bloke. Bernard has the Mark of Nurgle (Duh! ), Plague Sword and a pet Beast of Nurgle (which was worth its weight in gold, but more on that later). I could have given Bernard more effective Wargear, but I equipped him as I thought a Nurgle Lord should be. Bernard has the Fleshy Shoulder Pad that all his Army received on one side; on the other he bears the fly head of the Raptors, showing his heritage. Plague Marines, of course. Seven (Nurgle's number) of the most infected marines to fight for Bernard with a Rhino to get them into battle quickly. A note on Sqad size: I really tried to make all the squads 7 models, but points limits made me come up short on a couple of the squads. After I had already made my first squad of "regular" Nurgle Chaos Marines, I had a Problem. 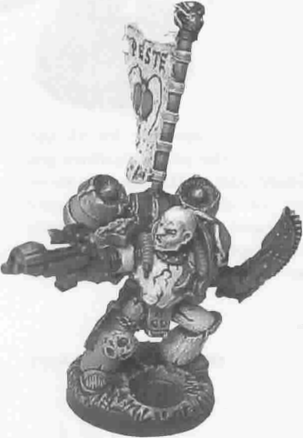 The "Regular" Marines would have made great Plaguemarines in any other Army. I had to set the Plaguemarines apart, making them elite. One of the US Games Workshop Trolls gave me the idea to use Skaven Plague Censor Back Packs. They were perfect. (As a plug for the US mail order, the Troll folks are all great gamers and are very helpful when it comes to this short of thing.) I wanted to have all the marine based units to have the same shoulder pads. I sculpted a Fleshy Nurgle Pad on one side for all the models in every squad, the plaguemarines got a metal Death Guard pad on the other to show they were part of the original Chapter (Veterans that they are). The Rhino was built to look old and corrupted, but not so changed so as not to be recognisable in its Imperial origins. Two Squads of seven marines. To give my army some flexibility, I made one squad Close Combat orientated, the other shootier. For Squad Botulus, the close combat squad, I gave them the Morning Stars from the Gothic Skeleton Regiment as weapons besides their bolt pistols. They have a Flamer as a special weapon. I like the idea to have the close combat guys without helmets, so they can see what they are doing. I made the Breathers for the squad from plasti card; I didn't think that they should have hoses (get in the way). Squad Contagion were more standard, Bolters and a Heavy Bolters, to provide some Fire support. The hoses are simply putty made into a snake and stuck on. Both Squads have the "Fleshy Pad" on one shoulder; the other side bears their squad symbol, which is repeated on the squad banners. The other troop squads are composed of Demons: Seven Plaguebearers and 4 Nurgling Bases (point problem). I really wanted to make the Nurgling bases stand out and look infested, so I used some bits and fallen Blood Angels to make them. Squad Peste: Now to have some fun! I like the idea of raptors, however the current figures (great for Khorne/Undivided) did not fit with the look I was going for. For most of them, I started with basic assault marines, but I used the old style metal jump packs (through mail-order) to give the squad an older look. 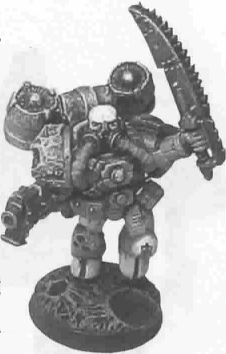 In the Rogue Trader book, there is a drawing of an assault marine with all sorts of hoses, etc. going into his helmet. I wanted my raptors to have that look. I used old Man-O-War bits to make the hoses, along with some putty. I really wanted to make the Raptors stand out, so I sculpted a Nurgle Fly Head on each one's Shoulder. On the other side, they have the "Fleshy Pad" that all the other models do. The Squad Banner Bearer is based on a Plaguemarine Champion who fit right in. I used a very old Nurgle WFB model as the base for the Squad's champion, Mestophilus; the fly head was just too good to pass up. I used some spawn legs to make the extra limbs, which are "Spiky Bits" in game terms. Mestophilus also has the Mark of Nurgle, Melta Bombs, and a Power Weapon. This is my favourite Squad in the Army. 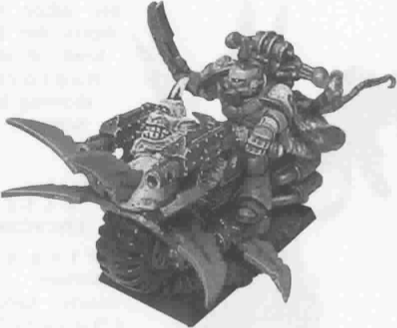 Plagueriders: A while back, I made a Khorne biker conversion. I used a Fleshhound to detail the bike; it was a pretty cool model. I wanted to try that with the Nurgle Bikers. I decided to "impale" a Plaguebearer on the front of each bike and go from there. I used a Plaguemarine torso for the squad's champion, Septicus, who has the Mark of Nurgle and a Power Weapon. These were the hardest models to convert; I couldn't make up my mind on how they should look. They have the same shoulder pad treatment as all the other models in the Army. I could not afford, point-wise, seven of the bikers, so three it was (that number did not work out well, however). Dreadnought "Lothar Bubonicus, Entombed Lord of Nurgle, Champion Eternal". This model started this entire army; see earlier for a picture. I based Lothar on an Epic Imperator Titan Kit, using the legs and Plasma Cannon from the kit. An older Great Unclean One provided the head and centre torso. I wanted it to look like the metal carapace could not contain Lothar's bloated bulk, hence the tentacles and bulges of fat made from putty. The left arm is made from a Beast of Nurgle; the idea was two-fold. Firstly that the power scourge grew out to replace its tentacles. Secondly that the Beast was entombed in the Dreadnought with Lothar and thus became "one" with him over time. Some parts from a plastic helicopter kit found their way into this model too. 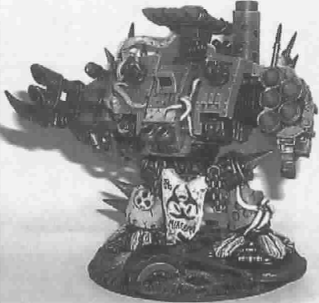 Dreadnought "Mangar Infectus". I already had Lothar done. I had a hard choice to make for my second Heavy Support, but as I said, I love Dreadnoughts, so there was no choice really. Since I had little or no armour defeating weapons in my other troop choices, I gave Mangar twin-linked Lascannons to give the army some additional anti-armour punch. For the conversion, I started with a standard Imperial Space Marine Dreadnought and went from there. I wanted the Dreadnought to tie in with the rest of the Army; the Fly-Head banner and Shoulder Sculpting helped in this. The model is on a Titan base, and to "liven" it up I added a dead Blood Angel (I really do not like the Blood Angels; maybe the red clashes with Nurgle's green). I made all the bases with putty. I used the round end of various brushes, hobby knives, etc. to make the craters. They were really easy to do and look good when painted up. I was going for a blasted, WW I-ish look. Battle debris and bits should be littered all over. I have a game table that is painted to look the same as this army's bases, along with craters, shattered buildings, etc. If you want an Army to look unified, consistent basing thoughout is a must. Whenever I attempt to do a major conversion, I first "brainstorm" and sketch out what I want the finished model to look like. I try to get the proportions right; this also helps to figure out what bits or figures that I need to make the model. I also try to plan the conversion so that I can disassemble it and paint it in parts. One of the great things about the green putty is that it will allow taking something apart after it has set. For example, I painted the Rhino Gunner off the model; the same was done with Mangar's arms and Banner. This separate painting makes it much easier to get at tricky parts of the model, lowering the frustration level with the larger, more complicated models. All the banners were made from putty! I like the way you can stretch it out, put it in a dynamic pose and it will stay that way. You can fray the ends and make it look old and battle worn.